It was a long drive. Everyone is tired. You considered eating out and then looked at your grumpy exhausted kids and thought better of it. Good call on getting a vacation rental with a kitchen. First, feed the kids scrambled eggs and toast and send them to bed. 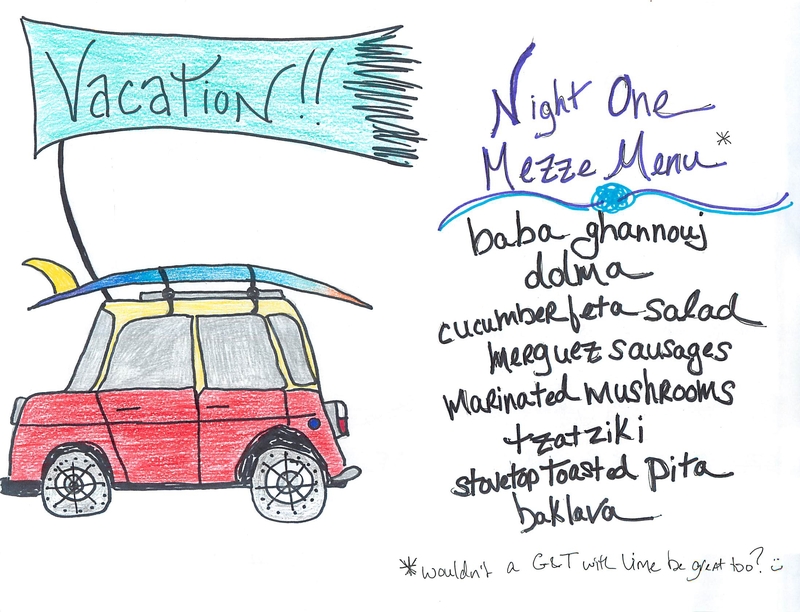 Next, for the adults, a “Mezze” menu of mostly assembly is in order. And since you’ve been driving, keeping it light seems like the right thing to do. This requires a little advanced planning – you need to pack this stuff in a cooler and bring it along with your 27 bags. Don’t freak out, it’s not hard. You can buy almost all of it and cook none, with two exceptions…the mushrooms should be made ahead, and I would prep the items for the cucumber salad before leaving and toss it all together when it’s dinnertime. Bring the sausage uncooked and toss in the broiler upon arrival. Toast the pitas. Mix drinks. Lay it all on a platter. Sit back and enjoy night one of vacation. Baba is a nice change from ubiquitous hummus. If you want to make it, try this, or BUY it! Mushrooms are best made ahead anyway. Look at this pretty cucumber salad which would be delicious in a pita with a sausage! Sausages, the only thing you are cooking upon arrival…maybe just broil them. And for baklava – you’re nuts if you want to make this but be my guest. I would consider buying here.